Our wedding package starts at $19.75 per person. call now to get 10% off though eventective. 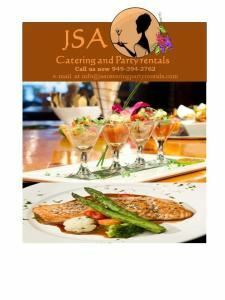 We are a one stop caterer and party rental company in Orange County.. JSA Catering is a Family Business. They started cooking for their relatives and friends parties while the daughter adopted her cooking from her mother and become her passion. The Daughter took and graduated as bachelor of hotel and restaurant management 1994 and worked in one of the hotel (SHERATON hotel) for a year. She joined and work on board luxury ship after a year working with Sheraton hotel . She travel Asia, Australia and Europe and America while working on board since 1995-2002. The daughter came to US settled with her husband and 2 son. The Family decided to take their passion into a business JSA catering and party rentals. Through thier long time experienced in hospitality service, JSA Catering and Party rentals is commited in giving a high quality customer service and delicious cuisines with thier elegant presentation from food to table setting. From that moment JSA Catering and Party Rentals quietly makes its mark by word of mouth, fueled by inspired dishes and a confident chefs. You will enjoy the finest, freshest food, expertly prepared and beautifully presented. Dishes includes American, Mexican and Asian food. Let JSA Catering and Party Rentals of Irvine, California, do all the work and take away your stress when it comes to event planing. We are focused on providing a high-quality service for your satisfaction, and accomplish this by offering a wealth of packages, menus, and party rentals at great prices. We are sure you will be happy working with us! Whether your event is a backyard wedding, children's birthday party, fundraiser, baby shower, or community celebration, JSA Catering and Party Rentals is here to help your dream event come true. Call us today to view our testimonials and gallery to see why we're known for the best services in town.